Was She-Ra A Feminist Superhero? A recent New York Times column lamented the lack of female superheroes for girls to emulate. But in the 1980s girls did have a superheroine: She-Ra, who, despite living in a pink castle and not wearing pants, was refreshingly robust. Little girls these days have lots of real-life role models, lots of ways they can be in the world, but they still have precious few larger-than-life heroes, especially in the all-important realm of fantasy, where they spend so much of their free time. And that's a shame. Superheroes, according to Danny Fingeroth, onetime editor of the Spider-Man comics and author of "Superman on the Couch," give kids (read: boys) a way to feel in control in an arbitrary world, where adults appear to make on-the-spot rules that they're forced to obey. "And then they look at the larger picture," he adds, "and see war and plague and people abusing authority. The idea that there's this superhero who uses the means of evil - violence - in a restrained, smart way to do good: that's appealing." In the end, that is the true drama of the superhero: the ordinary Joe who discovers that he has a marvelous gift, something that sets him apart from everyone else, simultaneously elevating and at least potentially isolating him, forcing a series of moral choices about the nature of might and goodness. It's a story writ large about coming to grips with power: accepting it, demanding it, wielding it wisely. Those themes are rarely explored in the fantasy culture of little girls, yet given how problematic power remains for adult women - in both fact and fiction - perhaps they should be. As there really aren't that many compelling female superheroes, Orenstein's daughter winds up playing Wonder Woman, just as her mother did in the 1970s. But many women who grew up in the 1980s may remember another heroine: She-Ra, who was introduced as a He-Man and the Masters of the Universe spinoff in 1985 as a cartoon series and toy line. Though the show only had two seasons and wasn't even shown in reruns after 1989, She-Ra fits Orenstein's description of a worthwhile character for girls, even though she was a "Princess of Power." The first season of She-Ra: Princess of Power has just gone up on Hulu, and both seasons are available on DVD. The plot of She-Ra is essentially a rip off of Star Wars, which makes sense, since He-Man was created to cash in on the film's popularity. According to the book Mastering The Universe by one of He-Man's creators, the character was invented so Mattel could compete with the toy company that made Star Wars figures. Thus He-Man was one of the first children's cartoons created solely to promote an existing toy line. But even before Adora (She-Ra's Clark Kent persona) discovers she's a "Princess of Power" and breaks the spell forcing her to work for the Horde, she's pretty feisty and isn't afraid to take on a sword-wielding maniac wearing only underpants. In the first episode the only most sexist comments come from He-Man, but, as the clip below illustrates, he also makes clear that he doesn't think Adora deserves special treatment because she's a female, as he's perfectly willing to hurl a sword at her chest. Adora is intelligent and brave even before she transforms into She-Ra, but the sword gives her superhuman strength and the ability to communicate telepathically and heal animals (as well as a slightly deeper voice and longer, more brushable hair). Her sword is the same as He-Man's (with the addition of a jewel), but neither of them use their weapon for maiming evildoers. Mostly the sword reflects laser shots or turns into a lasso. In the typical fight sequence below, She-Ra is shown to be as powerful as her twin and capable of defeating various bulked-up monsters on her own. She-Ra frequently has to rescue her "special friend" Bow, who grows so used to being the series' "damsel in distress" that by the time he ends up on a Horde slave vessel he takes his captivity in stride. He casually composes a song while imprisoned, knowing She-Ra is on her way to save him. That hug is about as racy as their relationship gets, perhaps because Bow's kind of incompetent and silly. Most of the characters in the series are women, who each have unique powers. While She-Ra's friends often assist her, there's no band of girlfriends she has to combine her powers with to fight an enemy; She-ra is clearly the sole hero of every episode. Like her friends, She-Ra's enemies are both male and female. Hordak, the main villain, is a vampire/cyborg-like male monster that was actually supposed to be He-Man's nemesis, but wound up on She-Ra. Not that the show avoids the cat-fight cliche completely. According to the toy line, She-Ra's greatest foe is the "jealous beauty" Catra. In fact, the She-Ra toys didn't match the show's tone and were far more sexist. She-Ra and her friends look like 5" Barbies and came in a wide variety of skimpy outfits and hair-colors. Though having scorpion claws for hands was commonplace in She-Ra's world, she didn't meet anyone with darker skin until the second season (and she was evil). But He-Man, who could flex muscles that human males don't even possess, probably did more damage to the body image of little boys than She-Ra did to girls. Her action figure wasn't quite as curvy as Barbie and pantslessness was the norm in Etheria. Every doll came with a brush and a comb and the accessory sets were entirely pink-hued, from She-Ra's talking horse to her Crystal Castle. "This is a great outfit! It turns any party Catra attends into a surprise party. When Catra starts in with her tricks, is she in for a surprise! My sparkly hat becomes a light-blinding shield. And the pretty parasol is really a cover for my sword!" "Don't you love surprises? I do! That's why I love this dress. Underneath these layers of veils, underneath the shimmering trim, is a special secret sword. So when trouble tries to take me by surprise, I can surprise it in return!" Though She-Ra's entire universe was ridiculous and she was only created to sell merchandise, the same could be said of male superheroes. Little girls who played with her probably focused on brushing her hair and running around their backyards with a cape and a sword rather than the show's empowering theme, but She-Ra is still a rarity among the characters marketed to little girls. 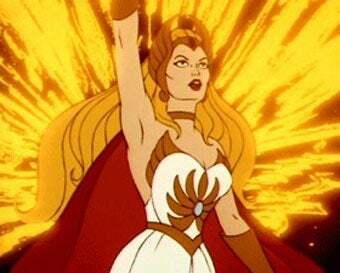 She-Ra may not be the ideal feminist superhero, but she wasn't just the male superhero's side kick or love interest. The character was strong, smart, and independent, and even if they didn't realize it at the time, she let little girls imagine how they'd use their superpowers.